Sure, data transfer doesn’t necessarily have too much to do with network congestion primarily caused by gazillions of short pings from smartphones polling for data, but that’s no excuse for such outlandish pricing schemes. If my 1Mb-per-second DSL line costs $45/month, and doesn’t have a transfer limit other than 1Mb x 60 x 60 x 24 x 30, or the amount you can grab in a month at the 1Mb/sec speed cap, why should something that does far less cost $60? For that $60 you get slower speeds, a tiny download cap, and the famous network congestion and spotty coverage that everyone’s always complaining about. Why should you have to pay extra for so much less? As far as I’m aware, all of the wireless carriers that offer similar services charge similarly exorbitant rates. To date, I have yet to see one of them provide a satisfactory answer as to why they charge so much for practically nothing. (And then talk about throttling smartphone users who dare to use the service they paid for…) All we get are allusions to the suppositious “unique constraints” of wireless networks, and talk of how network neutrality regulations would not only be impractical, but would cripple the networks. 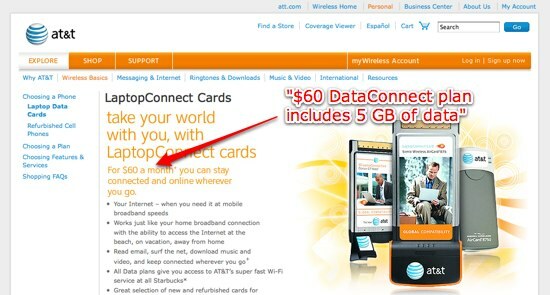 Actually – there are unique constraints to the cellular networks for AT&T and other providers in the US. Most of that is because they insist on using an old infrastructure not designed for high bandwidth applications and despite all signs to the contrary are insisting on sticking with that old technology and even installs more networks using the same garbage that's already up there. It's time for them to update. There's no reason we can't have a faster wireless connection to our phones than what we are getting through cable or DSL other than that their heads are stuck in the sand and they don't want to start the (admittedly) laborious process of updating their infrastructure. I wouldn't call that a "unique constraint" though. They're overselling their networks, sticking people with crazy-high prices, not delivering the promised service, and not using the money rolling in to upgrade the system. That's a business failing, not a technological one. The "constraints" can be remedied by performing upgrades that are long overdue, not weaseling out of necessary FCC regulation.